Emily Parker is the author of “Now I Know Who My Comrades Are: Voices From the Internet Underground” and a former member of the Policy Planning staff at the US State Department. The opinions expressed in this commentary are hers. (CNN) Russian President Vladimir Putin would rather ignore the Russian revolution, which marks its 100th anniversary this year. But in the Internet age, it’s impossible to erase history. Ordinary Russians are commemorating the revolution on social media, the last platform for free expression in Russia. Why is Putin worried about something that happened 100 years ago? For starters, Russia’s strongman does not want to draw attention to a popular uprising that toppled an empire. The Russian revolution was, in fact, two revolutions. The February Revolution of 1917 bought down Czar Nicholas II and ushered in a period of liberal reforms. Months later, in what is known as the October Revolution, the Bolsheviks overthrew the provisional government. The October Revolution led to years of civil war and ultimately, to the creation of the Soviet Union. 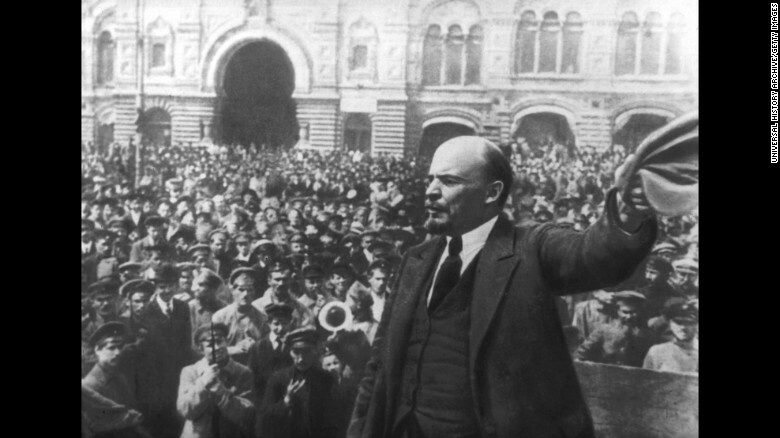 The Russian Revolution was one of the defining events of the 20th century. Yet Putin reportedly told his advisers that it would be unnecessary to commemorate the anniversary. There was no national holiday to mark the beginning of the uprising. Russian television followed the Kremlin’s lead in playing down the event. But Russian social media users refused to observe the official silence. Project 1917’s content comes from diaries and other historical documents, converted into social media posts. The posts span the events of 1917, covering the February Revolution, the October Revolution and all the turmoil in between. It’s not hard to understand why Putin would not like this historical interpretation. Earlier this year opposition protests swept across Russia, and Putin has shown little tolerance for dissent. This is not to say, however, that Russia today is reminiscent of 1917. Today’s economic conditions, for one, are not nearly as bad. “As Bolsheviks were saying 100 years ago, workers do not have anything to lose but their chains. Now workers have their cars and plasma TV sets and mobile phones,” Zygar says. Nor is Russia’s main opposition figure, Alexey Navalny, a modern-day Lenin. Navalny is a blogger and anti-corruption activist who intends to run for president of Russia in 2018. Navalny sparked protests by making a viral YouTube video alleging that Prime Minister Dmitry Medvedev had secret riches, including palaces and yachts. “Lenin was much more about comforting the afflicted, while Navalny is more about afflicting the comfortable,” Sam Greene, director of the Russia Institute at King’s College London, explained in an interview. Still, 1917 poses a narrative challenge for the Kremlin. How do you frame this momentous event? The Bolshevik revolution led to civil war and later to the terror of Joseph Stalin, whose legacyremains controversial in Russia. Some people remember the Soviet Union fondly, others see it as a dark period. Open debate could spark divisions in society. So for now, Project 1917 will have to live on the Internet. Zygar says that this kind of project simply couldn’t happen in the traditional media. A major television channel approached Project 1917 about doing a show based on its content, but then apparently got scared. Project 1917 has hundreds of thousands of followers on the social network VKontakte, proving that social media remains a relatively free oasis in an increasingly repressive environment. But for how long? Since the opposition protests of 2011 and 2012, largely organized on social media, Putin has been cracking down on the Internet. Authorities can block web sites, for example, without a court order. A state-friendly oligarch took over VKontakte. Just last month Putin banned virtual private networks, which can be used as circumvention tools enabling Russians to see censored Web sites. Project 1917 is not blocked, probably because it is not calling people into the streets. But as Project 1917 demonstrates, social media is not simply a tool for sparking street demonstrations. It also helps ensure that history will not be forgotten. The Russian Revolution won’t be televised, but it will be discussed.